CEDAR RAPIDS, IA - There's a new head coach in town for the Cedar Rapids River Kings, but he's a familiar face. 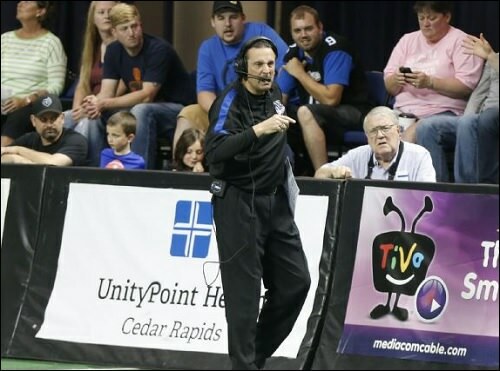 Veteran Indoor Football League head coach Mark Stoute has been named the next head coach in Cedar Rapids. He returns after being away for two seasons. Stoute takes over a team which went 3-11 last season, just one win over the Danger away from earning a playoff spot. Stoute's most recent coaching stop was last season with the Danger. After going 3-0 to start the season, and winning four of their first five, the Danger dropped six straight. Stoute was dismissed on May 20, and replaced by offensive and defensive coordinators Adam Shackleford and Cornelius "Pig" Brown as co-interim head coaches. Brown was elevated to full head coach in July. In four seasons (2013 to 2016) as head man for the Titans, Stoute compiled a 42-17 record and led the team to the playoffs all four seasons. He served a brief stint with the Jacksonville Jaguars of the National Arena League. He is overall 46-24 in the IFL and won IFL Coach of the Year Honors in 2013. Cedar Rapids will enter its eighth season in the IFL, and the first under new owners Roy Choi and Matt Stone, who purchased the team in June from previous owner Chris Kokalis. Former Spokane Shock/Empire general manager Ryan Eucker was hired in August to fill the same capacity in Cedar Rapids. Shortly thereafter, the team announced that it would go through a re-branding process. The new name -- River Kings -- was announced on September 22. The logo and color scheme are planned to be announced in mid-October. The River Kings are one of five returning IFL franchises from the 2016 season. The Barnstormers, Rattlers, Green Bay Blizzard, Nebraska Danger and Sioux Falls Storm also return. The team also will have a pair of new additions in the expansion Tucson Sugar Skulls and the Quad City Steamwheelers, which made the jump from Champions Indoor Football earlier this month. There remains a possibility that more team additions to the IFL may be announced. The Tucson franchise announced its name, logo and color scheme on September 20. The IFL will enter its eleventh season in 2019.